"Tired of the same old, boring carrot cake? 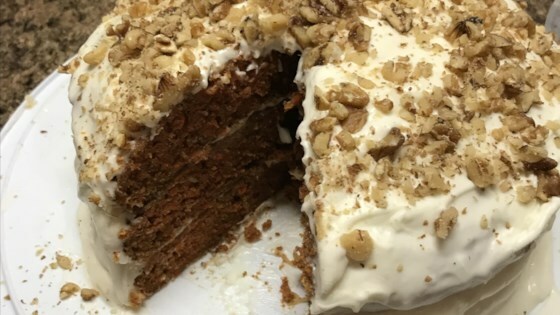 THIS is the Carrot cake you'll love forever! A little different because some of the ingredients aren't what you'd find in a 'normal' carrot cake. My own MOTHER, who despises anything coconut, had two helpings for dessert and took some home!! Don't knock it until you try it!! You'll never go back to that boring recipe again." See how to make a sweet, moist and rich cake with cream cheese frosting. Feel free to omit the coconut, walnuts, or raisins as your taste buds suit you. However, getting rid of the pineapple will take away from the moisture of the cake. Yes, this recipe is a good one and is exactly like the Cypress Point Carrot Cake recipe from the 70's cookbook, Diet for a Small Planet.